I'm looking to have my 3yr old and 5yr old set up with the smallest but safest child seats. Porsche have their OEM versions but question whether they're the lowest profile and best value options. Any thoughts or first-hand experience with the 991? I put a Britax Boulevard 70 in my 991. It's a little fugly and a little more upright than I prefer (poor little 2 year old folds over when he falls asleep) but it fits (forward facing) and it is mounted VERY securely using both latch attachments AND the back anchor. I asked my dealer and she told me that depends on the age of the kid, the Porsche Junior plus is for age 3.5 to 12 years old, whereas the Porsche Junior (ISOFIX) is for age 9 months to 4 years old. The Porsche Junior plus fits well in the rear seats and can be secured with the rear seat belts of the car. However, I think Porsche brand must be the most expensive one. Are these still available? I have read that they are not. I think they still available. My dealer said she will order one for me before my car arrive. We just got a Recaro ProSport for our grandson. Does the ProSport fit in the back of a 991? Looking at the 3D imagery, it seems the base is pretty square, hence my question. I've done a ridiculous amount of research and comparison of child seats over the last 12 years +/- (applying the "if you've got a $10 head, get a $10 helmet" philosophy) and I prefer the Recaro seats -- their Booster and the full harness type are both strong and designed with head and neck support. The Porsche seats are good, too. A "travel" cushion (a donut that wraps around the neck to support your head while sleeping in an airline seat) is a good preventative measure, too. There's some useful (and disconcerting) research at Consumer Reports (http://www.consumerreports.org/cro/car-seats.htm) and in my humble it comes down to Recaro (overpriced, but so it goes) and Britax (excellent safety and functional design along with strong, durable materials.) That's not to say that all the seats from those two brands are best and I have two seats from Porsche that I think are very good -- one Booster, one that has rigid arms that extend into the anchor rails, which I think makes more sense than loose fabric straps and buckles and I found another brand of airline approved booster that's been great for traveling but I don't recall the brand. I'm yet to decide on which new model car seats to put in the 991, so I'm keen to see what others do. I'm also considering this, which I've ordered, but haven't installed, so I can't say. I currently have Recaros in 3 different cars for my son, but i doubt they will fit in the back of the 991. They are massive. For a trip to Europe this summer i just ordered a Cosco Scenera. 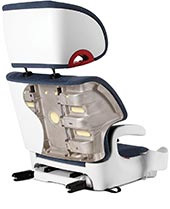 It is widely lauded as the best travel car seat due to its relatively modest dimensions and weight. My hope is that it will also slot into the 991.
) for the older kids (6 and 7) which seem terrific. But I'd prefer a harness seat forward-facing in the back for my little one (3.5y/31lbs/37"). I tried to remove the seat cushion (the one you sit on) in the new 991 and it seemed pretty clearly to be attached to the middle piece, so not removable individually. I didn't look harder as it seemed obvious. Do you know the seat is removable? The lower back padding (the piece with the LATCH icons) is removable like in previous models, being attached with velcro. I ordered two Bubble Bums (AMZ: Amazon link) for the older kids (6 and 7) which seem terrific. But I'd prefer a harness seat forward-facing in the back for my little one (3.5y/31lbs/37"). I'm afraid you're right -- the removable piece is just the cushion coveing the LATCH anchor rails. I'm sorry to have been misleading, I should have checked more thoroughly on the description of "removable lower cushion" and the diagram I saw in print, but I still haven't found the tech doc on-line or any material on the 991 at this (simple) level of detail. Mr Porsche doesn't seem to sweat the details when it comes to the owner actually using the car -- the rear seats are a better design than the 997.2, but still fall short of the objective. Finally got around to test-fitting the Clek -- it's far too wide for the 991. It's even too wide for the belt buckle location in the back seat of a Mercedes GL ... that's a full size SUV! When we did a test fit for seat comfort, both kids (petite girls ages 6 and 11) said the seats were too hard and the seat base cushion too short (literally only half the leg support of the Recaro) ... they both declared the Recaro a much happier place. I have the Bubble Bum as well and it is a really convenient for test drives (why not share the fun of test driving the 991 with the little ones)! I found on my test drive yesterday that the regular booster I have did not fit in the back so I was lucky I had the Bubble Bum with me or we would have been done before we started. But i have a question that will expand the child seat discussion a bit, how does everyone feel about letting a child ride in the front seat (I have a 6 year old and two 3 year olds)? I would need to be able to take all of the kid's sometimes so I would need to put the oldest in the front. The salesman is checking to see if there is still the key to turnoff the passenger airbags like in the 997. Obviously very interested in the discussion about the seats to use in the rear as well. The rears seat bottom cushions are velcro, too, and area below is carpeted. They are of course attached to the center piece, but if that is not impossible to remove somehow, then the seats will follow w/o issue. Sorry, not very helpful info. Keep hoping that someone clever/brave will figure out how to remove the center piece and see if transmission tunnel is carpeted, too.